Musings of a Paramedic in Suburban Philadelphia, Pennsylvania. Had a fun time yesterday with my friends from FOAC (http://www.foac-pac.org/) for the annual PA Gun Rights rally. I spent the morning helping prep a couple of new team leaders for the afternoon advocacy event, so I actually missed much of the speeches - but I did get some crowd pictures. Looks like we had 500+! As I said on Twitter yesterday, we were able to get more folks to turn out to a weekday rally in PA in pouring rain than the "Demanding Mom" folks could muster in Indy (their founder's home town) last weekend, in nice weather. Someone won a gun... A S&W Shield. Don't know who... But it wasn't me <sad face>. After the rally, we split into teams and went into the Capitol building. Every legislator's office got a visit from us - on the House side, we were talking HB 921 (get rid of PICS and just use NICS), HB 2011, a bill to help fight preemption violations, and HB 448, this term's Parking Lot bill. On the Senate side, we were pushing for SB 448, the PICS-to-NICS bill, and SB 876, a mirror bill for preemption violations. Hopefully we'll see all 3 of these bills pass this session. I don't see anything particularly disturbing. 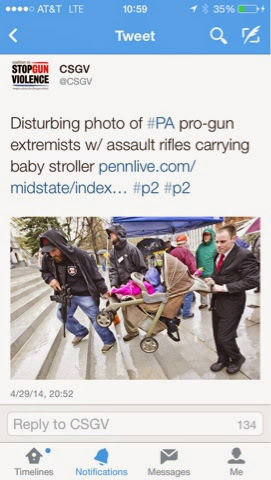 There's good muzzle and trigger-finger discipline, and it's 3 concerned gun owners carrying a stroller up the steps in the rain. That's just courtesy! Draft ILCOR Advanced Airway Recommendations: Banning Paramedic Intubation-What System will be the First? When the Balloon Goes Up!